The 2018 Winter Olympics have begun and Daily Hive is here to help, giving you a list of the most interesting events you should keep your eye on each day. Whether you’re staying up, waking up, or just setting your PVR, here’s your evening/morning guide for what to watch. For anyone obsessed with Tessa Virtue and Scott Moir, you’d better find a television on tonight. That’s because the ice dance competition begins. It’s the second-last time you’ll ever get to see Virtue and Moir skate in this competition at an Olympics. The short dance begins at 5 pm PT / 8 pm ET, with the Canadian gold medal favourites skating 20th out of 24 pairs. Medals will be decided after tomorrow’s free dance. 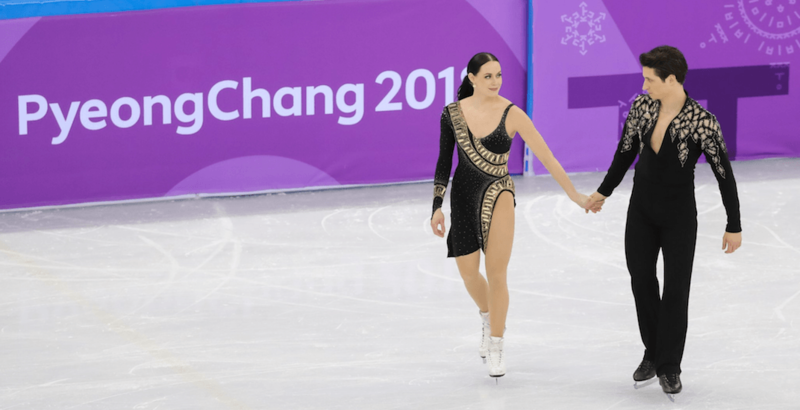 Virtue and Moir are looking to go out on top in their final Olympic Games. Canada’s Justin Kripps and Alexander Kopacz are in second place after two runs in the two-man bobsleigh competition. The third run goes at 3:15 am PT / 6:15 am ET, with the fourth and final run beginning at 5 am PT / 8 am ET. Everyone assumes Canada and USA will meet in the women’s hockey gold medal game again this year, but they’ll each have to take care of business in the semi-finals first. Canada takes on the Olympic Athletes from Russia at 4:10 am PT / 7:10 am ET. USA has a slightly tougher matchup against Finland at 8:10 pm PT / 11:10 pm ET. Canada has three entries in the men’s 500-metre race in long track speed skating, with Laurent Dubreuil representing our best hope at a medal. After an 0-3 start, Rachel Homan and the Canadian women’s curling team is looking for their third straight win to even their record. They take on Japan at 4:05 pm PT / 7:05 pm ET. Kevin Koe and the Canadian men’s team (4-2) play USA at 9:05 pm PT / 12:05 am ET.